Happy Mount Park is situated at the eastern end of Morecambe’s Promenade. 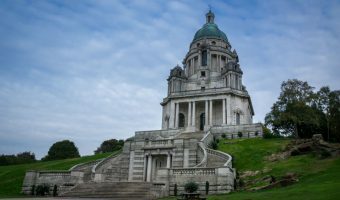 It originally opened in the 1920s and is now one of the best parks in North West England. Things haven’t always be so rosy. In the 1990s the park gained national fame when Noel Edmonds opened the World of Crinkley Bottom here. The theme park, based on the character Mr Blobby, was a disaster and closed after just a few weeks. The fiasco, often referred to as Blobbygate, cost local taxpayers around £2 million. Today, not a trace of Edmonds’ plump pink and yellow creation remains. Happy Mount Park is once again a free public park. It offers a wealth of attractions catering to families and children. A broad avenue runs the length of the park from the gates on Marine Road East. Formal gardens lie immediately left of the entrance and in the summer months are the venue for brass band concerts. Continue along the avenue and on the right there’s Café Rastelli; a long-established business offering homemade meals, salads, snacks, and speciality teas and coffees. Pirates in the Park occupies the other half of the same building. It’s a fantastic indoor soft play area with inflatables, climbing frames, and ball pits. It can save the day if the weather takes a turn for the worse. 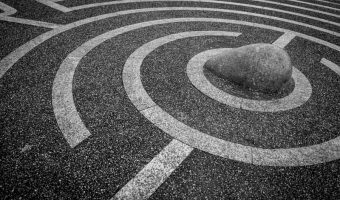 In front of the café there are trampolines, an 18-hole crazy golf course, and a traditional roundabout. The area on the opposite side of the avenue is home to a play area for young children, a putting green, and the park’s famous swing boats. The next area of the park offers sports facilities. On the southern side of the avenue there’s a multi-purpose sports area where visitors can play tennis, basketball, and five-a-side football. On the northern side there’s a bowling green. Casual bookings for the sports facilities can be made at the park’s kiosk. The next attractions encountered are Splash Park, Playland and the Happy Mount Park Express. Splash Park is an outdoor water play area with water jets, sprinklers, and water buckets. There’s nothing like it at any other park in North West England. 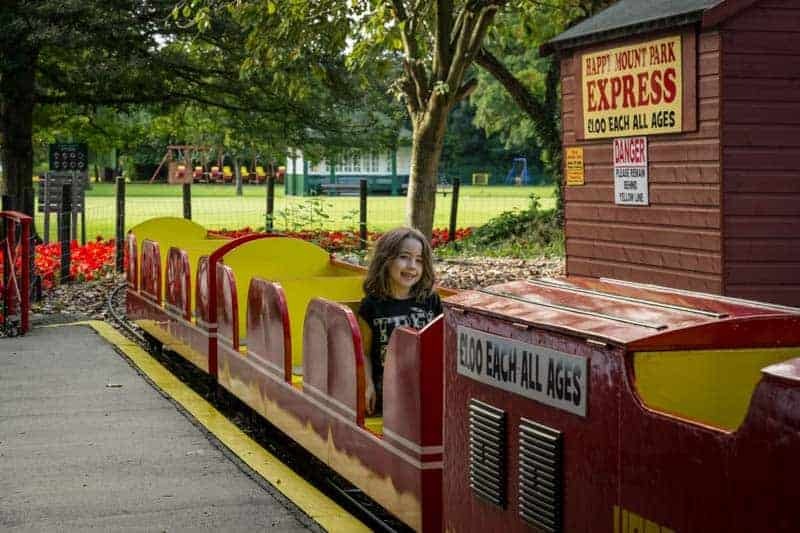 The Happy Mount Park Express is a miniature railway while Playland is an enclosed area with lots of children’s cars, bikes, playhouses etc. Continue south and you’ll come to the Japanese Garden. Between March and July amphibians such as frogs and newts can be seen in the ponds here. The final section of the park is home to the Natural Adventure Play Area. This is one of the most recent additions to Happy Mount Park. 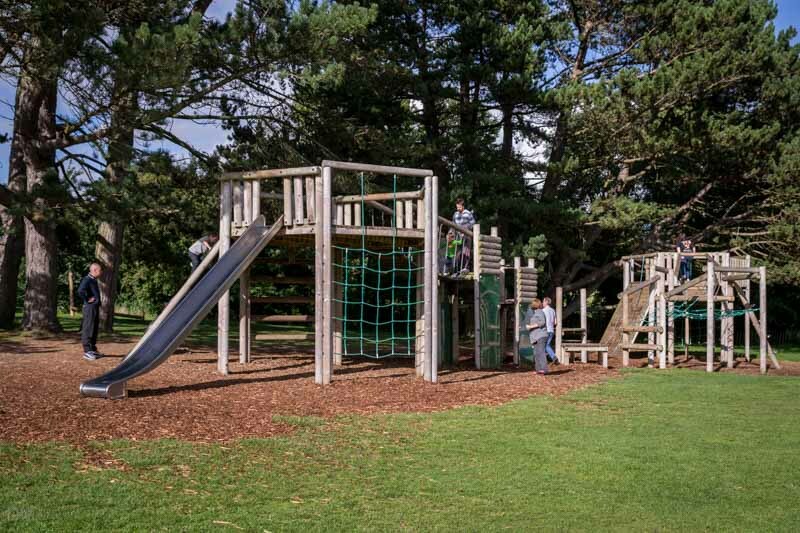 The adventure playground offers a zip wire, a large climbing frame, basket swings, and more. Entrance to Happy Mount Park is free. There’s a small charge for certain attractions such as Playland, Pirates in the Park, the Happy Mount Express, swing boats, putting green, trampolines, and crazy golf. There’s no charge for Splash Park or the Natural Adventure Play Area. Happy Mount Park is the venue for many of Morecambe’s most popular events. Brass band concerts are held every Sunday from May to September. Performances begin around 2.30 pm and last for around two hours. Details of other events can be found on the official Happy Mount Park website. 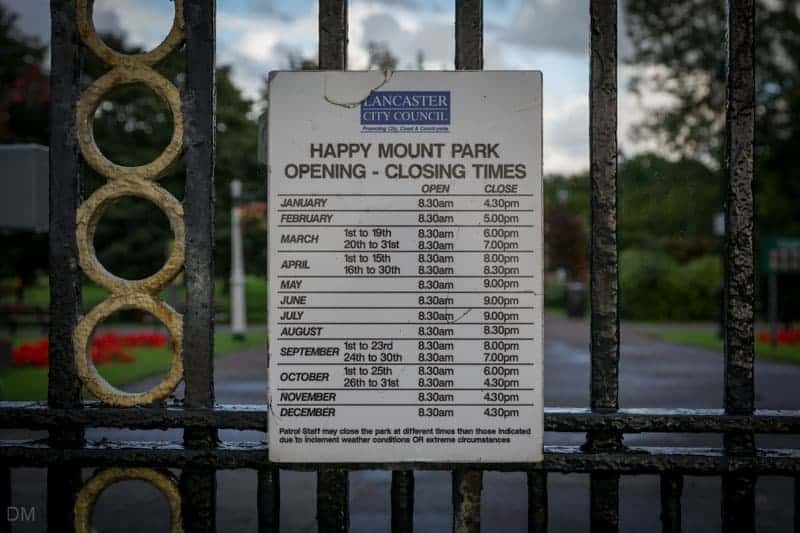 Happy Mount Park is open seven days a week. It opens every morning at 8.30 am but closing times vary throughout the year. For example, in May, June and July the park closes at 9 pm, in August at 8.30 pm, and in November, December and January at 4.30 pm. A schedule of opening and closing times can be found at the entrance to the park. Some of the attractions (Splash Park, putting green, swing boats etc.) are seasonal and are only open during the summer months. Dogs are allowed in the park but must be kept on a lead. Dogs are not permitted in Splash Park. 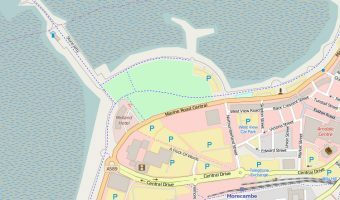 The park is located on Marine Road East in the Bare area of Morecambe. To find it from Morecambe town centre, simply drive east along the Promenade. Morecambe Golf Club is adjacent to the park. Lancaster City Council’s Coastal Road Car Park is also here. Satellite navigation users can use the postcode for the golf club (LA4 6AJ) to find the car park. Parking fees are reasonable. Free street parking can be found on Happy Mount Drive, to the south of the park. The nearest train station is Bare Lane, approximately half-a-mile from the park. 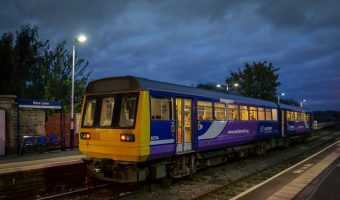 Services run from Morecambe and Lancaster. Buses to Happy Mount Park include the 5 service from Overton to Carnforth (via Heysham, Lancaster, and Morecambe). It stops at Morecambe Bus Station, opposite Morecambe Train Station. Map showing location of Happy Mount Park. This is a great day out for all ages and it’s free. I love this park and always send my friends here when they say they have nowhere to go with the kids in school holidays. It’s so expensive to take them out. Well this is free and it’s great. I agree completely. It’s a great park. One of the best in the North West. 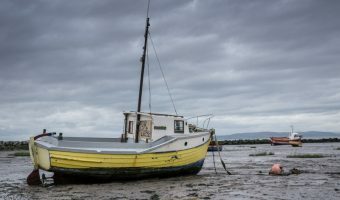 It was just a fantastic trip for me and my family as we live in North Devon and last week we came down to the lake district for a little while and we decided to visit Lancaster and Morecambe area and then we found Happy Mount Park and the day we spent there was fab!! Sam my youngest child loved going on the mini train ride and Toby my second eldest loved the mini golf and the park area for older children. There were mostly teens in it but he loved it. My daughter Sarah loved the swinging boats and the water area. Me and my Husband just enjoyed sitting and relaxing with a cup of coffee and watching the kids have fun and enjoying themselves and meeting new people and playing with them. Me and my partner loved Happy Mount Park. The kids loved the mini golf and the water splash area. It was a great day out for all of us. We are all looking forward to visiting there again some time soon. 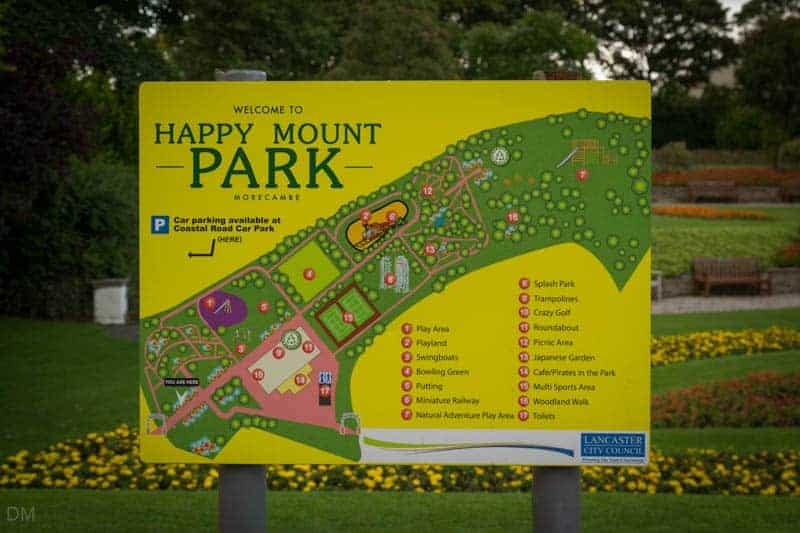 I TOO LOVE HAPPY MOUNT PARK WISH THERE WERE MORE LIKE THEM AROUND THE COUNTRY WE ALL NEED A LITTLE HAPPINESS IN THESE TIMES OF WOE. 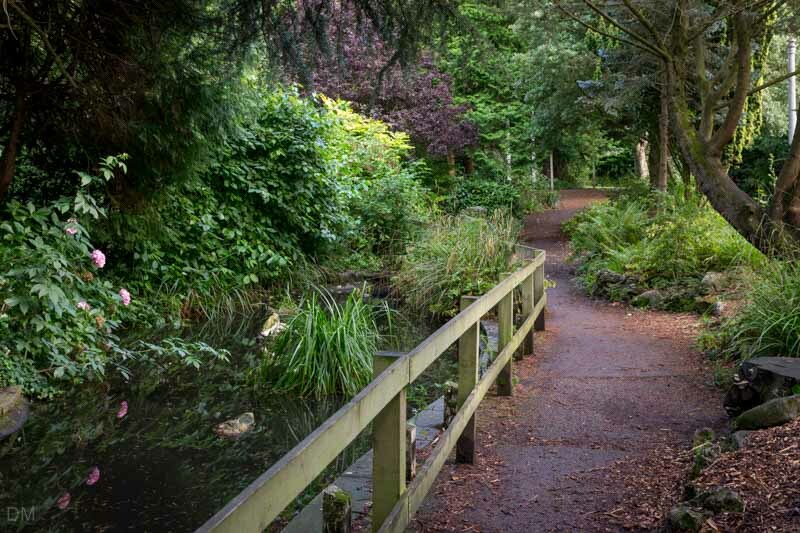 WE HAVE JUST HAD A GRANDCHILD AND LOOK FORWARD TO TAKING HIM TO ENJOY THIS FANTASTIC PARK IN THE FUTURE, AS WE DID WITH OUR CHILDREN WHEN THEY WERE SMALL. HAPPY DAYS. I been going happy mount park for the past 30 years and absolutely love it. I enjoyed it as a kid and now my kids have pleasure of enjoying it too. It is a shame that they don’t have illuminations any more. Had a lovely day on Saturday 9th April sun was beaming, but when we were leaving I went to the cafe to ask if they could fill up a bottle with tap water for my 3 children age 2,3 and 7. They said NO. I was really annoyed as I had had bottles of water that had ran out due to kids being thirsty and couldn’t believe they refused. I used to love coming here but after the man’s attitude i wont be back again. I love Happy Mount Park. A kick around with my best pals make the summer top class. I love the crazy golf too. Although it’s really hard I love a challenge. I love Happy Mount Park. My kids love the facilities and most of all the fun! We have been visiting the area for the past 3 years and the park is a must. Our daughter loves everything – putting, miniature train, crazy golf, etc. It is a pleasure to visit. I took my 2 year old last week. It’s a fantastic park and there should be more like this in other towns. Best day out for a long time. Highly recommended. Happy Mount Park is a fabulous day out. The water play area is so much fun, not just for the kids but for adults as well. You will be amazed at what a good time can be had by all here. Great park, but the food in the cafe left a lot to be desired. The new splash zone is fantastic. The kids absolutely loved it! There could be a bit more open space for kicking a ball about with the little ones, but the woodland walk is lovely and the picnic area is great. You do have to pay 20p for the toilets but they are clean and well cared for. Fantastic place for the family. Toilets were also modern and clean which makes a huge difference. I didn’t mind paying the 20p. The new toilets are a lot better than the old scruffy ones. The council have finally sorted them out, but you do have to pay 20p to get in. I’m 11 years old and go to Happy Mount Park every year with my family. We go each summer as a family outing. I personally love the trampolines. I’ve found that I’ve never grown out of it and probably never will! We went to Happy Mount Park last Friday and what a day we had. My parents took our two children aged 2 and 5 last year and they couldn’t believe how much it had changed. It is a fantastic place catering for children of all ages. We struggled to get them out and we are taking them back asap with swim stuff ! Absolutely brilliant! Thank you Happy Mount Park. Just been to Happy Mount Park’s Easter Eggstravaganza day. Which was fantastic my two children both won a Cadburys easter egg for winning the children’s Easter races. My children are looking forward to the magician day on the 20th April. If it is anything like the Easter day I will be returning again and again with my family. Full of family fun and would recommend the park to all. The food we got in the cafe was also fantastic as was all home-made and fresh. This park pool is fantastic for your kids. They can play under the leaky tap or sit on the wet fountains. Your kids will love it! This is a really lovely park. I love coming here. The new paddling pool is fantastic. My kids love it. The council have finally got one thing right. Morecambe’s Promenade has been restored and now features public works of art. 54 acre public park overlooking the city of Lancaster. Train station in the Bare area of Morecambe.